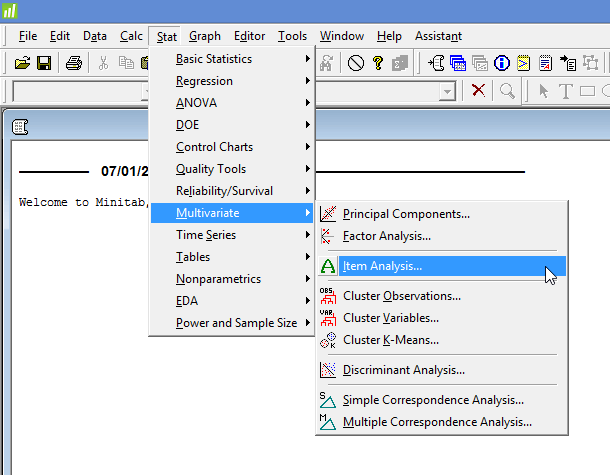 Cronbach's alpha in Minitab - Procedure, output and interpretation of the output using a relevant example. Cronbach's alpha is a common measure of internal consistency ("reliability"), often used when you have multiple Likert questions in a survey/questionnaire that form a scale and you want to determine if the scale is reliable. It is also often used in conjunction with a data reduction technique such as principal components analysis (PCA) or factor analysis. For example, imagine a researcher wanted to create a questionnaire that measured "job satisfaction". The questionnaire consisted of eight questions and was completed by a sample of 60 participants. The researcher was satisfied that the eight questions were measuring the "job satisfaction" construct, but wished to know if they were reliably measuring this construct, (i.e., whether the questions used to measure job satisfaction were "internally consistent"). To measure this internal consistency, the researcher calculated Cronbach's alpha for this eight-question questionnaire. 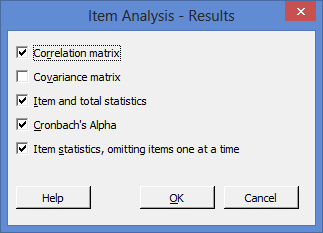 Note: When using a Cronbach's alpha, your variables (e.g., the questions in a questionnaire) are often referred to as "items". When these items are grouped together (e.g., all the questions in a questionnaire), it is often referred to as a "scale". In this "quick start" guide, we show you how to carry out a Cronbach's alpha using Minitab, as well as interpret and report the results from this test. First, we start with the example we use in this guide. A questionnaire was developed that intended to determine "employee motivation". The questionnaire consisted of 6 questions (i.e., 6 "items"). A total of 315 participants completed the questionnaire. Each question was measured using a 5-point Likert item from "strongly disagree" to "strongly agree". In order to understand whether the questions in this questionnaire were internally consistent, a Cronbach's alpha was run. 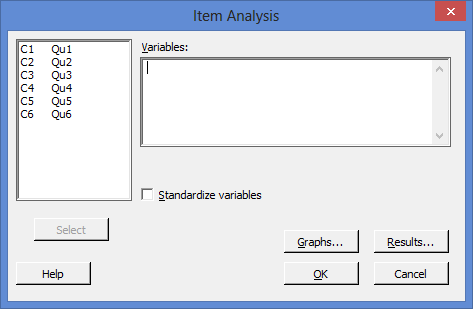 In this section, we show you the three steps required to analyse your data using Cronbach's alpha in Minitab. Note 1: To transfer all six items, you first need to click inside the main left-hand box and select all the items (e.g., C1 Qu1 through to C6 Qu6). This will activate the button (it is usually faded: ). Then, simply press the button. Alternately, you can double-click on the six items, which will automatically transfer them into the Variables: box. The Minitab output provides some useful descriptive statistics, including the sample size for each item (the "Total Count" column), as well as the mean and standard deviation (the "Mean" and "StDev" columns). You are also provided with the Cronbach's alpha (α) score, which in our example is 0.8230 (the Cronbach's Alpha row), indicating a high level of internal consistency for our scale. Higher values of Cronbach's alpha are better. What constitutes a good level of internal consistency differs depending on what source you refer to, but all recommended values are 0.7 or higher. 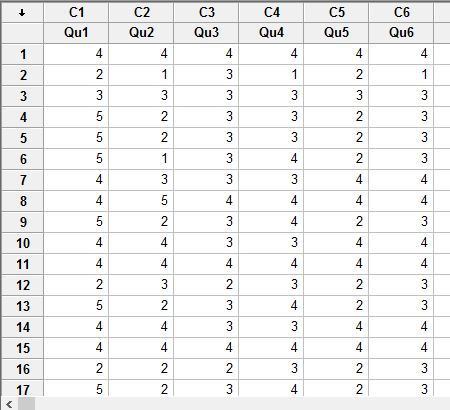 Another valuable section is the final table, which shows the 'contribution' or 'fit' of each item to the scale, providing useful statistics such as the mean and standard deviation (the "Adj. Total Mean" and "Adj. Total StDev" columns), adjusted Pearson correlations and squared multiple correlation (the "Item-Adj. 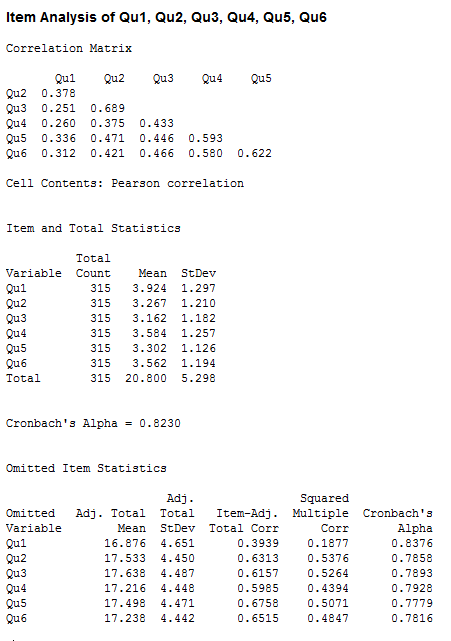 Total Corr" and "Squared Multiple Corr" columns), and Cronbach's alpha score (the "Cronbach's Alpha" column) if an item was removed from the scale. B. Information about the construct you are measuring and how many items it has. C. A statement of the level of internal consistency, including the Cronbach's alpha score. A questionnaire was employed to measure the construct, 'employee motivation', which consisted of six questions. The scale had a high level of internal consistency, as determined by a Cronbach's alpha of 0.823.